After a terrible Friday of fishing all day and not catching anything, I decided to do a redemption spearfishing dive on Saturday. I headed out in the early morning to search for some new grounds that I had not dived before. I arrived at a promising-looking spot, dropped my anchor and suited up. After I slipped into the water and looked around for a bit, I was happily surprised that there was an abundance of fish around. I swam around for about an hour and a half and got a few goatfish, an uhu and a couple of tako. I was about to move spots when I came across a nice-sized school of kala. I breathed up for a bit and dropped down on the pile. As I was down on the bottom waiting for the fish to come in, I spotted something coming toward me on my left. At first I thought it was a big rainbow runner, until it turned broadside and I realized it looked like a big hamachi. The thought went through my head that it might also be a kahala. I decided to take a shot on it with my Hatch Rhino Chaser as the fish was swimming away. It wasnt the greatest shot, but I could see it was a holding one. The fish put up a good fight and made a couple of good runs. I secured the fish and dispatched it quickly so it wouldnt suffer. It was definitely a day I will never forget. I turned this hamachi into an awesome plate of sashimi and fried up the collars with some garlic butter and capers. It was so good! I shared the rest of the fish with some of my friends and family. 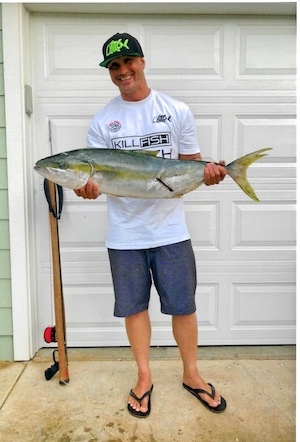 I want to give a quick shout-out to Kill Fish Company and Hatch Custom Spearguns for all of their support!